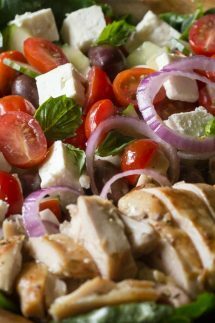 Grilled Greek Chicken Salad is the perfect healthy chicken salad and is bursting with spring and summer flavors! Topped with a red wine vinaigrette, this would make a great lunch and is hearty enough to serve for dinner. I used cherry tomatoes as that’s what I had available, but if you have homegrown tomatoes they would be wonderful in this grilled Greek Chicken salad. It’s really important that you don’t skimp on the marinating time! Leaving the chicken in the marinade for at least an hour will allow the flavors to permeate the chicken before you cook it. If you don’t want to cook the chicken on and outdoor grill then I recommend you use a cast iron grill pan, it does a fantastic job! 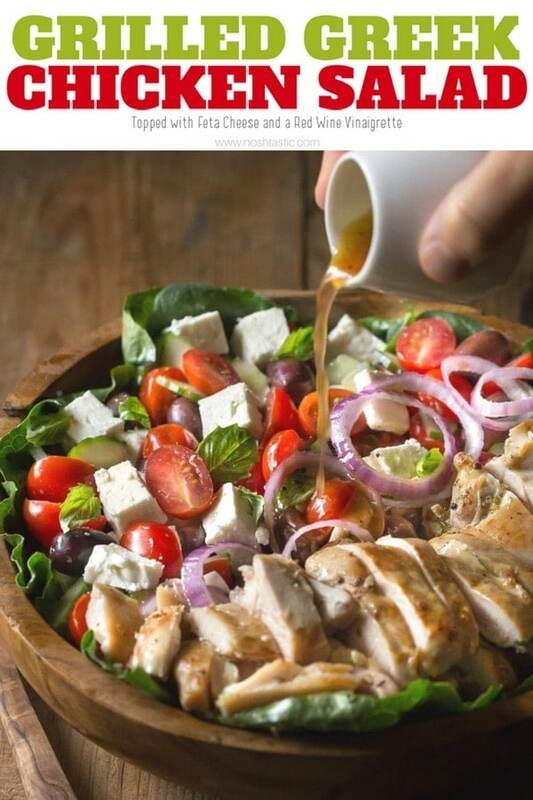 If your red wine vinaigrette has been sitting for a while you’ll need to remix it before you pour it over your grilled Greek Chicken salad. Mixing bowls – I have this set and I love it as it gives me a ton of bowls but they take up very little space. Whisk – I love this one, it’s my favorite! Wooden Salad Bowl – this is a lot like my salad bowl, plus it comes with ‘salad hands’ too. Cast Iron Grill Pan – I love my Lodge grill pan, it can even make real grill marks if you get it hot enough. 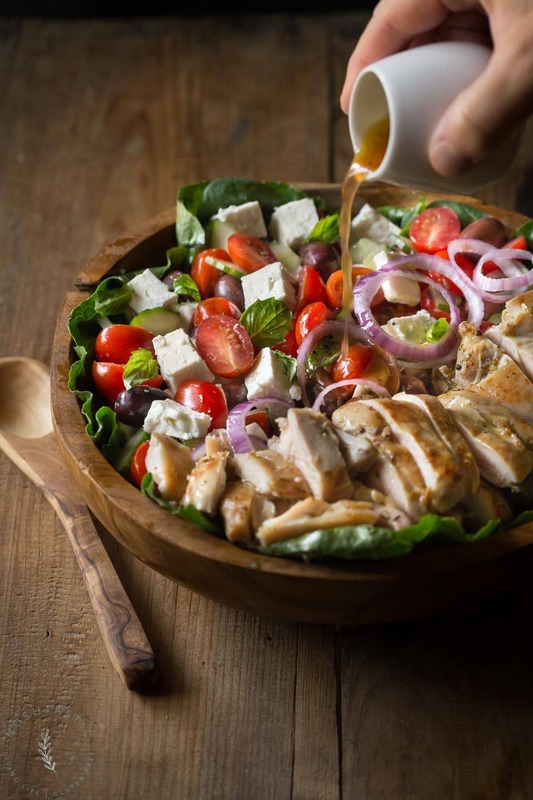 Easy Grilled Greek Chicken Salad, full of fresh flavors! Mix together the Greek chicken salad marinade and pour over the chicken. Marinate for 1 hour. Cook the chicken on a grill or in a cast iron skillet with a little oil on a medium heat until it's cooked all the way through. Usually takes about 10 minutes. 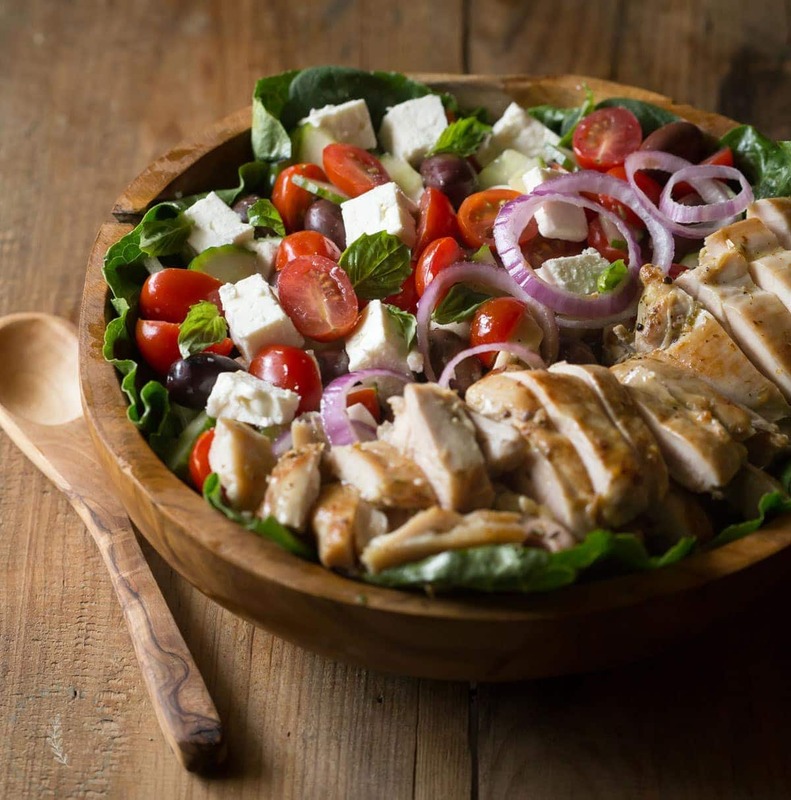 Assemble your Greek chicken salad by adding the grilled chicken, romaine, spinach, feta cheese, tomatoes, olives, cucumber, and onions. Pour over the red wine vinaigrette and toss the salad, you may not need all the dressing. Nutritional information on Noshtastic is provided as a courtesy and is approximate only. We cannot guarantee the accuracy of the nutritional information given for any recipe on this site. Sheena is the proud owner of Noshtastic, a gluten free website that specializes in easy family meals including Low Carb, Keto, Paleo, Whole30, and many pressure cooker recipes. We specialize in easy gluten free family recipes, including, Low Carb, Keto, Paleo, Whole30, and Pressure Cooker.